Core parking basically makes your processors go into a sleep state known as (C6) and is supported by most knew processors and modern Operation Systems. This allows your computer to save power. There is a trade off for disabling parking. If you use a laptop or tablet, you may notice a slight difference in battery life once you disable core parking on your CPUs. If you disable core parking on your CPUs, your computer may have faster benchmarks. (Reported higher frame rates by gamers and power users). Core Parking dynamically disables CPU cores in an effort to conserve power when idle. Disabled cores are re-enabled as the CPU load increases once again. This technology is very similar to frequency scaling, in that it seeks to throttle the CPU when idle. The state of individual parked cores can be observed in Resource Monitor under the CPU tab, on the right side. Core parking is a optimization, based on the observation in previous operating systems that you might have four cores running background processes at 10% utilization each. The idea is to load all of those tasks onto one core and let the others idle if operating load levels allow for it. Now, you can see how these two features working together might have a significant impact on power, as ideal core prevents rabid thread migration, while core parking optimizes loading. Taken together, the pair intelligently maximizes the number of idle cores, and then keeps them from being spun up unnecessarily, yielding the theoretical power gains. Especially mobile users benefit from core parking, while desktop users may benefit from it indirectly on their utility bill. For some multi-core processors, core parking is not enabled by default, and if you want to enable the feature you will be hard pressed to find any tools or information that allow you to do that. Core Parking is a new Windows kernel power manager and kernel scheduler technology that helps improve the energy efficiency of a system by dynamically scaling the number of logical processors that are in use based on workload. Similar to how processor performance states help scale the performance of a single processor, Core Parking is designed to help scale the performance and energy efficiency across the set of logical processors in the system. When the Core Parking algorithm reduces the number of logical processors that are in use, it parks some of the logical processors in the system. The kernel scheduler correspondingly gives preference to unparked logical processors rather than parked logical processors when it schedules any non-affinitized threads. This lets the parked logical processors become idle, which in turn lets the corresponding processor cores transition into a lower power idle state. Core Parking is most effective on systems that have processor idle states with extremely low power consumption. When combined with ITTD, Core Parking helps reduce the amount of interrupt activity on systems that run Hyper-V. On systems with processors that include Intel's Hyper-Threading Technology, Core Parking is also leveraged to help intelligently schedule work between threads that are running on multiple logical processors in the same processor core. The main reason is to reduce the consumption of power (electricity) and production of heat. Microsoft has realized that most of normal users do not need to have all of their threads active for every day usage (including high graphic gaming), so by default they disabled it, however, Windows is able to enable the idle threads upon heavy usage, for example when compiling heavy codes or rendering heavy objects and then make them idle after the heavy usage. This is pretty safe and good since you will not produce a lot of heat and consume a lot of power and at the same time you will get benefit of the whole CPU power when needed. In a way parking CPU is earth friendly. In tests, we’ve found AMD processors benefit most from disabling core parking. This is perhaps due to the dramatic difference in the way AMD processors share (hardware) computational resources between logical cores. Microsoft optimized for Intel's Hyper-Threading Technology, which has much less capable secondary cores. AMD’s secondary logical cores are near full CPUs. System Monitor II is Windows 10 gadget will allow you to easily enable or disable core parking for your CPU. The first thing that you should do is to go to a resource manager to check if you have parked cores. The reason of doing so is that core parking is not enabled for all the multi-core CPU's. System Monitor II also can show you if you have parked cores. The change will take effect without a reboot. Let me explain some settings. We can enables this settings, but for this we can change few registry keys. Gadget do this, if you check Enable working with registry box. Of course, you can give permission by clicking yes. 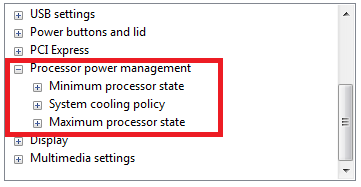 Allow processor to use throttle states in addition to performance state. 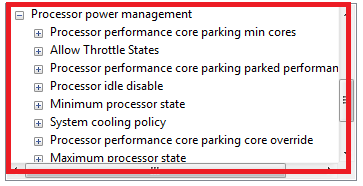 Specify what performance state a processor enters when parked. Ensure at least one processor remain unparked per core when enable. This feature doesn't work under Windows 8 or above.